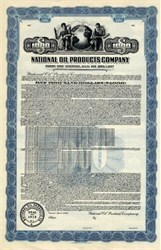 Beautifully engraved Specimen $1,000 Bond Certificate from the National Oil Products Company dated 1940(Green) and 1942(Maroon). This historic document was printed by the Hamilton Banknote Company and has an ornate border around it with a vignette of two allegorical men on the sides of a world globe with the company's name on it. 30 coupons attached on right side. This is the first time we have had a bond for sale from this company. The company was a broad based integrated chemical firm with established positions in hydrocarbons, heavy chemicals and intermediates, and speciality chemicals. National Oil Products Company changed its name to NOPCO Chemical Company in 1947. NOPCO Chemical merged into the Diamond Aikali Company who shortly thereafter merged with The Shamrock Oil Company to form the Diamond Shamrock Corporation in 1967. The company changed its name to Maxus Energy Corporation in 1987. In 1910 T. R. Evans and a group of Pittsburgh businessmen formed the Diamond Alkali Company to produce chemicals for the glass industry. During WWII the company began making magnesium oxide, a component of incendiary bombs, and in the 1950s moved into producing organic chemicals, plastics, and chromic acids. In 1967 Diamond Alkali merged with Shamrock Oil & Gas (an oil, gas, and fertilizer producer and marketer) and became Diamond Shamrock. It merged with Natomas Company in 1983, thus gaining gas and oil wells in Canada, Indonesia, and the North Sea. Diamond Shamrock in 1984 agreed to clean up its dioxin-contaminated New Jersey plant. The next year low energy prices forced the company to post losses of $605 million. Smelling blood, corporate raider T. Boone Pickens made a hostile takeover bid for Diamond Shamrock in 1986. In defense, it spun off its refining and marketing arm, which retained the Diamond Shamrock name, and the exploration and production company changed its name to Maxus. (Maxus was bought by Argentine oil firm YPF in 1995.) The new Diamond Shamrock, based in San Antonio, went public in 1987. The company entered the petrochemicals business two years later and in the 1990s added refineries, expanded pipelines, and increased retail gasoline outlets in the Southwest. It splashed out $260 million in 1995 to acquire 661 National Convenience Stores in Texas. The next year the company merged with Ultramar to form Ultramar Diamond Shamrock. Ultramar was founded in 1935 as Ultramar Exploration Co. Ltd. by four South African gold mining concerns (including Consolidated Gold Fields) to develop Venezuelan oil fields. The company, which worked closely with Texaco, changed its name to Ultramar Co. Ltd. in 1940. It began oil exploration and marketing operations in Canada in the 1950s and marketing operations in the US and Europe in the 1960s. By 1975 Ultramar owned 1,100 gas stations in eastern Canada. During the 1980s oil slump, it struggled and was forced to sell its UK marketer, Ultramar Golden Eagle. LASMO, a UK oil company, bought Ultramar for about $3.2 billion in a hostile takeover in 1991. The next year LASMO spun off the North American refining and marketing operations as Ultramar Corp. -- the company that ultimately joined with Diamond Shamrock. In 1997 the new Ultramar Diamond Shamrock acquired Total Petroleum (North America) from TOTAL, bringing it three refineries and some 2,000 gas stations. As the oil market took a turn for the worse, Ultramar Diamond Shamrock agreed in 1998 to combine its Canadian operations with Petro-Canada, then scrubbed the deal because of Canadian regulatory opposition. It also contracted PG&E to manage its energy purchases and reduce its energy costs over seven years. That year it began a restructuring plan to divest underperforming assets, including 239 convenience stores. President Jean Gaulin succeeded Roger Hemminghaus as CEO in 1999 (Gaulin became chairman in 2000; Hemminghaus, chairman emeritus). That year the company's plans to merge its operations with those of Phillips Petroleum were called off after the two could not agree on terms. To retrench, it sold its marketing and transportation operations in Michigan to Marathon Ashland Petroleum, but had to close a 50,000-barrel-a-day refinery in Alma, Michigan, because no buyer could be found. In 2000 Ultramar Diamond Shamrock agreed to buy Tosco's Avon refinery in California for $650 million.